In the 65th Toronto Cub Pack, the youth play games, do crafts and learn how to earn badges during the weekly 7-8:30 p.m. Monday evening meetings in the gym at Roncesvalles United Church. Proud Cub with Quinzy - winter camp. 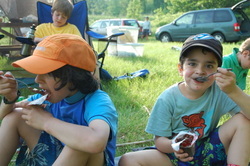 Cubs at play during summer camp.